Visitors to Wentworth Castle are now able to enjoy the return of the conservatory after the successful completion of a ground-breaking £3.75 million restoration project on time and to budget. Bootle Glass was commissioned by the chief builders to play an instrumental role in the specialist renovation of Wentworth Castle, a historical Grade 2 Listed estate in Yorkshire. The Conservatory was constructed in 1885 by Crompton and Fawkes who described it as an ‘iron winter garden.’ It is a rare surviving Victorian glasshouse that would have been used to display some of the many exotic plants, including orchids, palms and ferns collected by the family from around the world during its day. 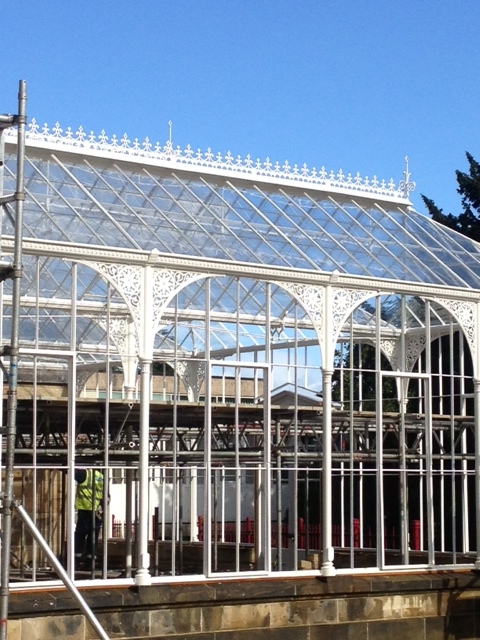 The historic restoration, which was a culmination of a 10 year fund raising campaign, involved the conservatory frame being glazed using a hand drawn glass typical of the late Victorian era – that was toughened to meet modern building standards. With each panel of handmade glass a bespoke size, the massive project was completed over a 15 month period. Opened to the public in November by Mayor of Barnsley, Councillor Ken Richardson, the conservatory is now a stunning architectural gem and brand new learning space suitable for visitors all year round.